10% Special Staff Discount on stays of 2 or more nights. 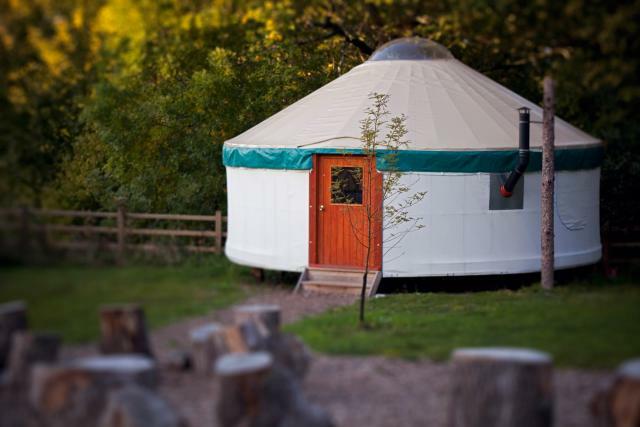 Yurtcamp is the ultimate luxury Glamping experience. Set amongst 40 acres of beautiful Devon Woodland and no matter what time of year it's a picturesque setting. Venture for woodland walks, trial our amazing forest assault course, listen to the birdsong and gather round the open fires. We are ever so close to Dartmoor, seaside towns, heritage sites, cycle trails and many outdoor attractions and activities. We have 22 contemporary yurts both small and large in our yurt village, woodland setting or the more outback secluded locations, great for groups or individual bookings. Each yurt comes with a fully equipped kitchen, cool box and ice packs, log burner and fire wood, comfy beds, solar lighting and access to a fire pit for BBQ's and camp fires. Most of the site and several of the yurts are wheelchair accessible. Group bookings are welcome however there are limitations (unless it's a family group) during certain dates especially public and school holidays, please contact us directly before making a booking on 01626 824666. Please note that unfortunately we do not accept all male groups especially stags do's, however if you are connected to a sporting group, company event or similar then please contact us to discuss your enquiry. Details: Book any time of the year to get this fantastic 10% off offer especially created for NHS staff and health professionals.